The Pump Storage Scheme at La Muela in Valencia is the biggest of its kind in Spain. The upper reservoir has a circumference of 4,800m and stores 23 million cubic meters of water, generating a similar amount of energy to that of a nuclear power plant. A major upgrade program was necessary, consisting of the construction of a new underground power house, tunnels and penstock. 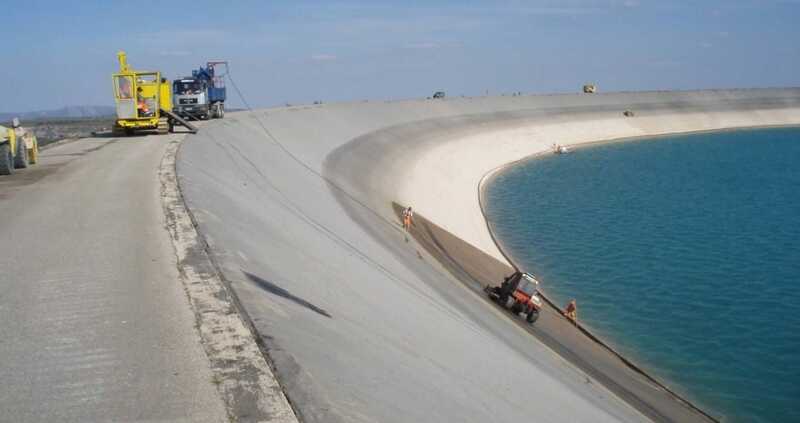 As a shutdown of the plant had to be scheduled to undertake the upgrade, WALO was commissioned to carry out a mastic renewal of the upper reservoir, which covers an area of 1,400,000 square meters. The particular challenge facing WALO was to undertake the work after only partly emptying the upper reservoir so the work had to be carried out above the water, avoiding any contamination of the water remaining in the reservoir. This meant that the huge amount of sediment on the slopes, which was cleaned off by WALO had to be removed from the site by truck, without any of it being washed into the reservoir water below the work area. To add to the challenge, the only access to the site was via the crest road. This presented a huge logistical problem as that route could easily be blocked by just one vehicle so the movement of materials and work teams was very restricted and had to be carefully planned. After a scheduled shutdown of the Pump Storage Scheme, the upper reservoir was partly emptied so that only 25% of the water was left and a new mastic coating was installed by WALO. The works consisted of cleaning the existing bituminous face by hydro-jet washing and removing the sediment on the slopes, spraying a new bitumen emulsion and applying a new mastic sealing to the 43m long slopes which have an incline of 1:1.6.